An innovative app that accompanies you with safety back home. Five students from the University of Michigan designed a GPS application, named Companion App. This new app allows your contacts from your smartphone to accompany you virtually when you return home. It is free and available for Android and iOS and it is used for safety purposes. Αfter the successful installation of the application, the user chooses some contacts from the phone’s contact list and sends them a request to monitor their movements via GPS map. This functions as an alarm, if an unexpected incident such as a robbery attempt occurs. 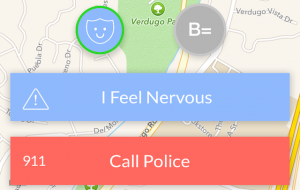 The user has the choice to instantly call the police or if they are on campus, the app also alerts the campus security for an ultra quick response. The recipient, who is not obliged to have installed this app receives an SMS containing a hyperlink which refers to a map that monitors whether the user follows the predetermined path. If the application detects that the user is astray from this path or starts running or stops moving, the application asks the user ‘’Are you ok?’’. Then the user has 15 seconds to answer that there is no problem. Furthermore, users have the option “I am nervous” when they feel threatened on the road. This is a mechanism that feeds the Companion App database for the purpose of mapping the areas of a city which are more dangerous and cause fear or insecurity compared to other vicinities. Despite the fact that this app has been created to aid students, it has vastly spread by capturing the interest of several people of different age, nationality and gender. The great majority of them love to use this app and complaints regarding the application’s functionality are few. This application is quite useful and necessary for people who feel insecure or live in areas of high criminal activity. As it is a new application, it does not record if it has contributed, even a little, to battling criminality, but it is certain that it creates a sense of security and peace of mind both to the user and to those who monitor them. It is worth taking into consideration that this innovative application may provide a sense of comfort among parents of young children as well as the elderly who are in danger of getting lost. Furthermore, it enhances one’s role in a community (e.g. the university community) and connects its members with the strongest bonds. “Giving up privacy for safety isn’t something I’m super willing to do, especially not when I can just call for help if I need it. I’ve grown to enjoy walking through my city when no one knows where I am. I like being alone. I like it a lot.”. These two comments require a much more substantial analysis and careful consideration than simply the design of a new app. In today’s societies, which are inevitably products of globalization, where the fear of crime and victimization is diffuse and the risk for the individual multiplies daily, it is natural to devise solutions in order to eliminate or at least minimize these dangers. Modern technology, having made great strides in the recent decades, constitutes a state-of-the-art “weapon” in the hands of the authorities. Hence, the prevention of criminality in our daily life is given as pretext. This is bound to engender more negative effects on our private life under the form of massive surveillance, thus violating fundamental rights every human being is entitled to, namely the need for privacy and secrecy of communications. Thereby, people are encouraged to blindly accept these interventions in exchange for security. Additionally, while crime prevention measures should aim to eliminate the factors and the conditions that might lead someone to committing an offence, unfortunately, nowadays we see that when talking about prevention we essentially imply suppression. For these reasons, surveillance might not be the answer to safety. Finally, I would like to focus on the choice “I am nervous” and the rating of areas as high-risk or not. This option might result in bias and increase patrolling in areas that users report as being dangerous. How reliable and efficient is this choice in order to categorize a neighborhood? Does it create false conclusions and wrongly target an area? In a nutshell, whether Companion App has positive or negative effects, we shall not underestimate its originality and its major breakthrough in the field of new media. However, it is undoubtedly a subject of discussion whether it remains a drastic solution criminality or whether it is one more product of technology that interferes with our lives.